Ramblers got their Premier League campaign off to a good start with a 3-0 victory against SKW on Sunday afternoon. Two goals by Donovan Swartz and one by Heinrich Kazerua secured their victory which saw them moving up to second position on the log behind African Stars. Swartz gave Ramblers the lead after only 9m when he intercepted a poor clearance by SKW keeper Charles Uirab to score from the edge of the box. Three minutes later it was 2-0 after another defensive blunder by SKW when they failed to clear a cross and an unmarked Heinrich Kazerua stabbed the ball home at the far post. Swartz sealed Ramblers’ victory early with his second goal early in the second half. Tura Magic shock Tigers - Tura Magic scored a sensational 3-0 victory against Tigers at the Independence Stadium on Wednesday night. Stay updated via SKW Facebook ! Black Africa picked up their first victory of the season ith a 1-0 win against SKW on Wednesday evening. 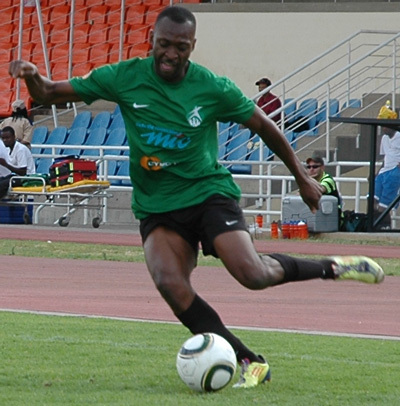 Roger Katjiteo scored the winning goal after only 11 minutes and although SKW staged a strong second half comeback, BA held on for the win. 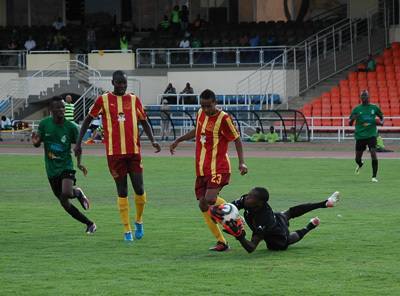 BA attacked from the start and Tara Katupose came close early on but Charles Uirab pulled of a fine point blank save. SKW finally succumbed to the relentless pressure when Katjiteo pounced onto a loose ball in SKW’s box to score from close range. Willy Stephanus and Klaas Blom both came close in further attacks for BA while at the other end a shot by Petrus Naftalie was well saved by Arnold Subeb. Worst start ever for SKW! A demoralized SKW team after the one zero defeat against Black Africa. Conclusion - one team poor the other even worse … The goal came was scored by Roger Katjiteo in the 11minute while Katupuse (BA) was red carded early in the second half. SKW beat Mighty Gunners 2-1 to join Tigers on four points. After a goalless first half Elvis Tjivasera put Stars ahead from the penalty spot while Mekondjo Tobias made it 2-0 four minutes later. Harold Ochurub pulled a goal back for Gunners with a minute remaining. African Stars maintained their perfect start to the league with a 2-0 victory against Tigers on Friday night. First half goals by Chris Katjiukua and Ninja Karongee gave them their fourth consecutive victory which puts them two points clear of Ramblers and Orlando Pirates at the top of the log. Ramblers beat Tura Magic 2-0 last Wednesday while Pirates beat Eleven Arrows 1-0 on Saturday, with their Zimbabwean striker Mabasa Kufahakutizwi scoring the winner on 58m. Defendiong champions Black Africa moved up to fourth position after beating Rundu Chiefs 1-0 in Rundu through an early goal by Bryan Bantam. 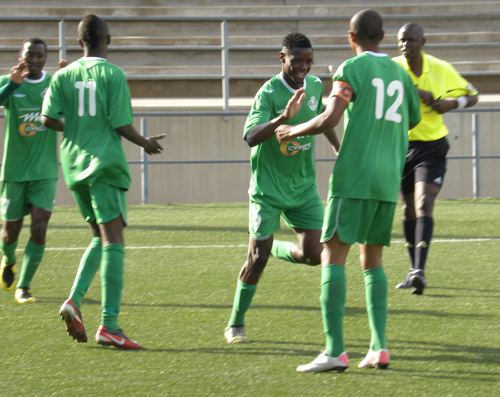 They are now on seven points, two ahead of Civics and Blue Waters, who played to a goalless draw in Walvis Bay. Gunners and Rundu Chiefs are bottom of the log on one point each. 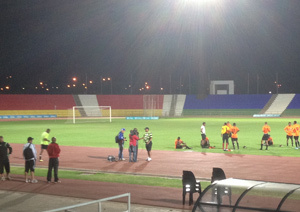 African Stars and SKW played to a goalless draw at the Independence Stadium on Friday night. Although there were no goals, there was plenty of action as both teams had several goalscoring opportunities. Bradley Wermann was first to threaten for Stars when he broke into SKW’s box on 14m, but the SKW defence managed to clear the danger. Two minutes later Deon Kavendji broke into SKW’s box but Festus Scheepers brought off a fine tackle. SKW’s first chance came when Sieon Tjiueza broke clear from a counterattack but Stars’ keeper Lloyd Kazapua brought off a point blank save. Stars looked more threatening with Riaan Cloete and Bradley Wermann both having shots saved in quick succession, while SKW keeper Charles Uirab brought off a diving save from a cracking shot by Deon Kavendji. Just before halftime SKW had a fine chance when Titus Nailonga was put clear from a counterattack but his shot from the right went wide of the mark. Clarence Foroma, who came on for Meraai Swartbooi in the second half immediately made his presence felt when he scored 2m after the restart but the goal was diallowed for offside. Foroma had another great chance when he received a throughpass from Riaan Cloete on 60m, but he took too long to control the ball and his shot was blocked. 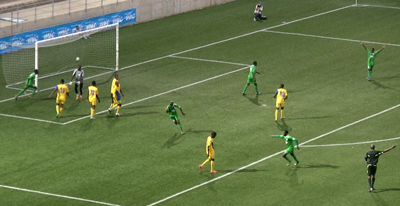 Simeon Tjiueza came close for SKW when he shot narrowly wide from a corner, while a the other end, Stars’ substitute Edwin Korukuve missed a great chance when he shot over the bar after racing clear of the defence. But the opposing defences held the upper hand as the match ended in a goalless draw. The result sees Stars regaining the top spot on the log although they are now just ahead of Ramblers on goal difference. SKW move up to seventh position on five points. 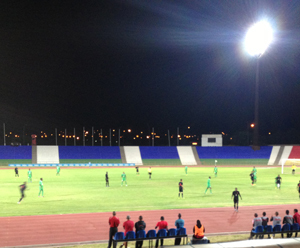 NPL (Namibian Premier League) Ligaspiel Freitagabend - African Stars 0 Cymot SKW 0. Der SKW hätte in der ersten Halbzeit alles klar machen müssen, als SKW Jungstar Petrus Naftali (Spitzname Papi) in der 44 Minute freistehend vergab. Auch Simeon Tjiueza scheiterte in der 18 min bereits an Stars Torhüter, nachdem er plötzlich allein vor dem Gehäuse des Tabellenführers auftauchte. In Halbzeit Zwei hatten die African Stars mehr vom Spiel und vergaben durch Riaan Cloete in der 80min ihr grösste Chance. Endstand ein gerechtes 0 zu 0, was dem Tabellenführer gar nicht schmeckte, der zwar immer noch ungeschlagen bleibt (5ter Spieltag). SKW ist somit der erste Verein, der Stars in der laufenden Saison einen Punkt abtrozt! Black Africa striker Roger Katjiteo and Eleven Arrows defender Erwin Kaujende are the joint top goal scorers with four goals each after completion of Round 7 of the Namibia Premier League last weekend. Seven players are tied in second position on three goals each. A total of 12 players are tied on two goals each. They include four players from Black Africa, namely Bryan Bantam, Eslin Kamuhanga, Willy Stephanus and Jerome Louis, who has been their top scorer for the past five of the past six seasons. Papi Petrus Naftalie (picture) scored SKWs winner in the 53minute after a brilliant through ball by Wesley Katjoteo. 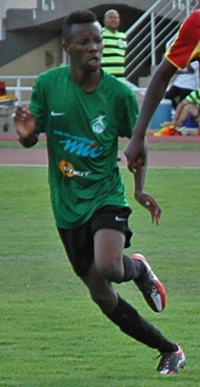 Edy Mangoumou opened the score in the 31 minute and Blue Waters equalised in the 38minute. 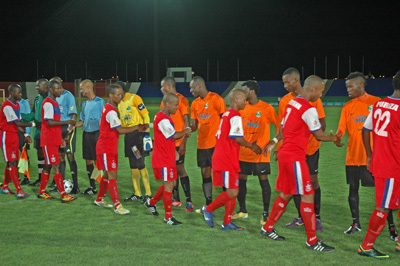 SKW’s poor season continued when they lost 4-0 to Civics at the Independence Stadium on Wednesday night. Erwin Afrikaner gave Civics the lead after only four minutes and two more goals just before halftime by Steven Gariseb and Afrikaner effectively sealed their victory. SKW couldnt penetrate Civics’ defence after the break, and Civics’ young substitute Llewellyn Stanley made it 4-0 just before full time. The result sees Civics moving up to sixth spot on 12 points, while SKW remain 10th on 9 points. Coach Lesley Kakuva fed-up with attitude of players. "There will be releases during the transfer window!" SKW beat Tura Magic 3-1 after leading 2-0 at halftime in their NPL Round 11 match on Friday evening. The 0 - 2 by Brandon Goagoseb (SKW, green jersey) in the 44min after a fine combination via the left attacking side. Raymond Mate (SKW) celebrating the 0-3 in the 49 minute. Goals by Raymond Mate on 51min and Elvis Tjivasera from the penalty spot on 85min gave SKW a deserved victory against a lacklustre Ramblers side. It was SKW’s second successive victory which sees them moving up to seventh on the log on 15 points, while Ramblers remain third, but are now 6 points behind the leaders. 85min - 0 - 2 Tjiueza is fouled in the box and Tjivasera scores from the spot. The 0 - 1 by Raymond Mate on 51min celebrating (SKW, green jersey) Saturday against Ramblers. SKW won the encounter by two goals to nil. Petrus Naftalie gave SKW the lead from the penalty spot in the 42nd minute but Alfeus Ngwezi equalised for Rundu Chiefs on 59 minute. 59min 1 - 1 Alfeus Ngwezi scores after great thrupass by Thomas Andjamba . 57min Rundu penalty after foul by Kambungu but Aseb shoots over the top. 42min 1 - 0 SKW penalty. Petrus Naftalie is fouled in the box and he steps up to put the ball in the corner of the net. More regional winners have booked their places in the second round of the prestigious Bidvest Namibia Cup to be played the Oscar Norich Stadium and the Sam Nujoma Stadium this weekend. Over the past weekend, 14 winners were confirmed from the regional second divisions and the nationwide first division as they finalised their Bidvest Namibia Cup preliminary matches. At Rundu Tropical Heat beat Eastern Chiefs 8-7 on penalties after a 2-2 score at fulltime in the final match for their region. Heat will now face African Stars in the second round of the Bidvest Namibia Cup at the Oscar Norich Stadium on Sunday 10 February at 16h00. Caprivi region’s King Fisher beat Katima Wanderers 2-1 in the final to book their date against Premiership side Eleven Arrows at the Oscar Norich Stadium on Saturday 9 February at 18h00 while Forever Thistles beat Rush Ups 3-0 in the Karas Regional final to confirm their battle against the Southern Stream First Division runners-up Swakopmund Sports Club (SSC) on Saturday at the Sam Nujoma Stadium at 13h00. Swakopmund Sports Club lost 2-1 to Try Again in the final and now Try Again will take on Sport Klub Windhoek at the same revenue at 15h00. Ramblers will take on Pubs FC from the Kunene region after the latter’s 4-2 penalty shootout victory over Black Africa Warriors, following their 1-1 draw. Golden Bigs lost to African Lions 2-0 in the final of the Northern Stream First Division with Onambula United besting Cuca Tops 4-3 on penalties after a one-all draw for third place finish. 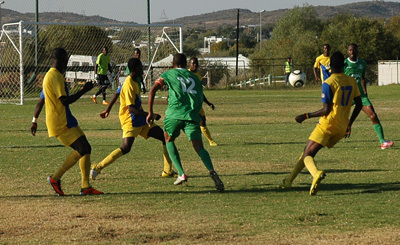 Bigs, Onambula and Lions progressed to the second round of the Bidvest Namibia Cup. Sailors from the Erongo region defeated Young Eleven 2-1 and will now face Omusati winners Young Braves. Ongete United beat Rebels 4-1 to win the Khomas regional playoffs and will face Golden Bigs in the last-32. Orlando Pirates knocked Black Africa out of the Bidvest Namibia Cup competition with a 7-6 victory on penalties after the teams were tied at 1-all at full time. First Division sides Hotspurs and United Stars were the big winners in Bidvest Namibia Cup action on Saturday as they beat Premier League sides Tura Magic and Civics respectively. Hotspurs beat Tura Magic 3-1 after a late comeback that saw them scoring three goals in the final five minutes. Black Africa took control of the game midway through the first half with two goals in three minutes by Willy Stephanus and Jerome Louis, while Bryan Bantam added the third after the break in which SKW doing mostly the attacking. Northern Stream First Division first division side United Stars vs SKW in NFA Cup 2013 Third Round. The last winners of the NFA Cup, Elven Arrows will face Orlando Pirates in the third round of the Bidvest Namibia Cup after the draw on Monday evening in Walvis Bay. Arrows who won the Leo NFA Cup match in 2011 in Walvis Bay will take on the 2009 winners of the Cup Orlando Pirates on the weekend of 2-3 march when the Bidvest Namibia Cup last-16 teams battle it out for quarterfinal places. Omusati’ Region’s Young Braves will look to knock out one of the big guns of Namibia football as they take on Rundu Chiefs, while Ohangwena Region’s Omafo United have a date with the 2010 NFA Cup winners African Stars. 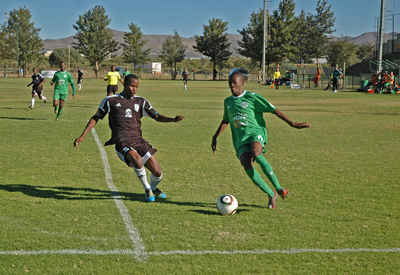 Southern Stream First Division side Hotspurs, who knocked out Premiership side Tura Magic will clash against rivals Tigers, while Northern Stream First Division first division side United Stars will take on another Premiership side SKW after dubbing Civics out in the previous round of the Bidvest Namibia Cup. 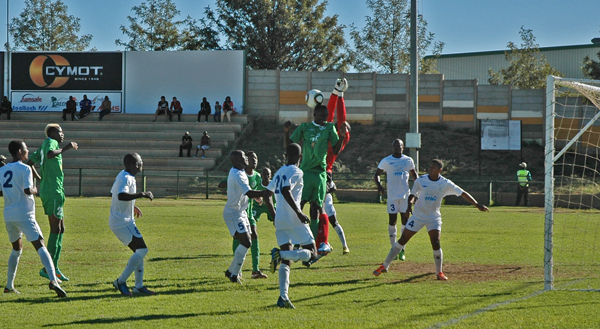 Blue Waters will face Ramblers in the second all-premiership clash in the third round of the Bidvest Namibia Cup. African Lions from Otjiwarongo and campaign in the Northern Stream first Division will take on Southern Stream first Division side Swakopmund Sport Club, while Golden Bigs also from the Northern Stream will face off against another Premiership side Mighty Gunners. There are 10 premiership sides in the last-16 clubs, four First Division sides and two second division clubs. Here is the full list of fixtures to be played on 2-3 March at venues still to be confirmed in the prestigious Bidvest Namibia Cup. Arrows vs. Pirates, Braves vs. Chiefs, Omafo vs. Stars, Hotspurs vs. Tigers, United Stars vs. SKW, Waters vs. Ramblers, Lions vs. Swakopmund, Bigs vs. Gunners. African Stars beat SKW 4-2 in an exciting Premier League match on Friday night to close the gap to three points on log leaders Black Africa. After a goalless first half the match sprang into life after the break when Riaan Cloete put Stars ahead after a throughpass by Jamu Ngatjizeko. 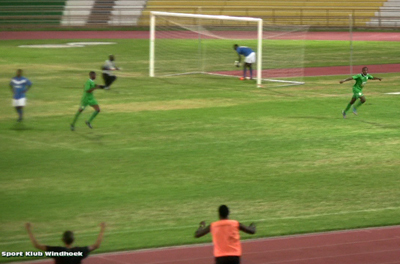 Deon Kavendji added Stars’ second goal while Cloete made it 3-0 from the penalty spot. SKW however struck back with two goals in two minutes by Festus Scheepers and Mike Sinvula, but Stars had the last say when William Chilufya scored from a long pass to make the final score 4-2. 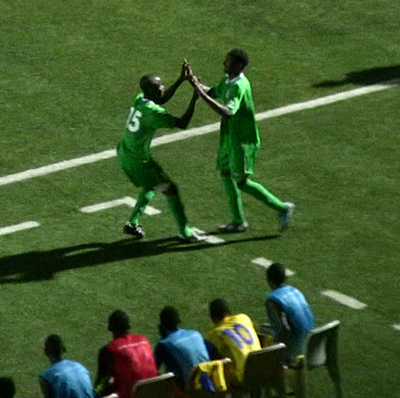 In Walvis Bay, SKW pulled off a surprise 2-0 away win against Eleven Arrows to ease their relegation fears. SKW move up to ninth position on 19 points while Arrows are tenth on 17 points. 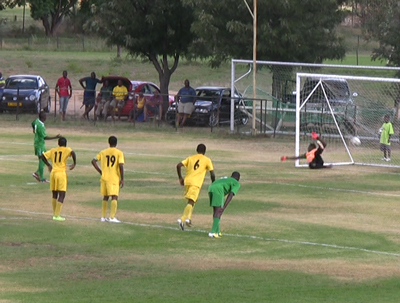 Blue Waters held Tigers to a goalless draw at the Sam Nujoma Stadium on Saturday afternoon. Tigers remain in fifth position on 24 points while Blue Waters are seventh on 20 points. In Otjiwarongo, Rundu Chiefs shocked Mighty Gunners with a 2-1 victory. Despite the win, Chiefs are still bottom of the log although they are now just one point behind second from bottom Mighty Gunners. SKW’s woes continued as they lost 3-1 at home to Tigers. Benson Shilongo gave Tigers the lead after only a minute when he rounded off a move from the kickoff, while Pineas Jacob made it 2-0 on 11 minutes. Elias Pelembe rounded off a counterattack on 77m to put Tigers 3-0 up, but Albertus Harobeb pulled a goal back for SKW with two minutes remaining. The result puts Tigers fourth on 28 points, while SKW are just above the relegation zone on 19 points. Although the bit better team over 90 minutes SKW didn't keep the any points at home! In the 18min SKW keeper Charles Uriab had to leave the field (late for a tackle as last man). Round 20 of NPL saw some big upsets as the log leaders Black Africa and African Stars both lost, while the bottom two teams Mighty Gunners and Rundu Chiefs both won to close the gap on the rest of the pack. SKW went three nil up in the first half, when several injuries' interrupted the play and allowed Civics to pull two goals back. "Papi" Naftalie Petrus scored after only 2 minutes and Mate Raymordt added the second after 7 minutes of play. Mate Raymordt had to be substituted after a serious knee injury in the 17th minute. SKW coach Lesley Kakuva was forced to bring on Mernin Nguvauva. Short after his appearance Nguvauva scored to make it 3-0. Harry Januarie who played for the cautioned keeper Charles Uriab advanced to the man of the match, while Petrus also showed off a good performance.